• Complimentary roadside assistance which includes flat tire change, battery boosts, towing and lockout service (valued at $69 per year). • All additional supplementary cards are free and do not carry any additional annual fee - odd to find as most banks charge at least $39 for each card. • Enjoy professional advice on entertainment, leisure and dining thanks to the free BMO concierge service. • The extended warranty feature means that you will enjoy up to 2 years over and above the initial manufacturer's warranty on any purchases made with this card. There is no need to buy an additional warranty yourself thanks to this feature. It is important to highlight that very few cards in the market offer anything over one year! • You will also enjoy extra protection against theft or damage for 90 days from the purchase date. • Cardholders enjoy travel and medical protection which covers collision damage to rental vehicles, emergency medical benefits for 8 days of out-of-country or out-of-province (up to $2 million), along with Trip Cancellations, Lost Language, and so much more! • If you spend just $600 in a month, your cashback will cover your annual fee. • The interest rate of 19.9% is acceptable but not particularly amazing. • Cashback is rewarded on an annual basis which some might see as a disadvantage when other banks offer rebates more regularly during a year. In order to qualify for this card, each applicant will need to earn an annual income of at least $70,000 or an annual household income of at least $120,000. These cards are great for everyday spending and, to make the most of the earning potential, cardholders are encouraged to pay as many of their monthly expenses by using this card. 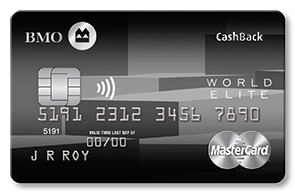 So, instead of paying with another card (with fewer benefits) or your debit card, get as much cash back as you can by swiping your BMO CashBack World Elite MasterCard instead! This card is also great for those who like the idea of receiving a cash incentive rather than another reward. For example, a card that offers AirMiles would suit somebody who enjoys regular vacations or is interested in traveling. If you prefer to use your rewards as you please, cash in your pocket will offer that kind of flexibility. There are clearly more advantages than disadvantages when using this card. If the interest rate spooks you a little, there is one easy way of managing that. Watch your spending and only spend what you can afford to completely pay off at the end of the month. Keep a record and monitor your expenses so that you use your credit card much like you would a debit card. To find out more about this card and many more, use our free tool at Wallet Savvy to compare all of the best options. There is no “one size fits all” when it comes to credit cards, but we can help you find that perfect fit! 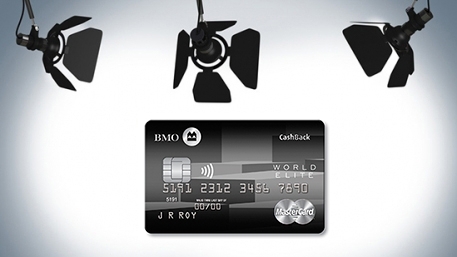 This newly launched card by BMO definitely offers a lot of great benefits among the cash back cards. We give this card two thumbs up.